Grazia France partnered up with Dior for the launch of the brand new Stellar Shine lipsticks. 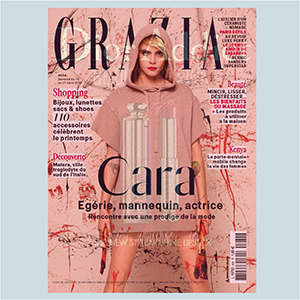 Grazia in fact designed an idea for an exceptional setting in all platforms of the brand. Grazia created a 360° experience shooting a fashion series wrapped in a particular insert inside the magazine and created stories on Instagram about the backstage of the shootings using the hashtag #bediorbepink. Moreover the project had developed a 3D lenticular animated cover exclusively for the lucky subscribers of the magazine with Dior’s brand ambassador Cara Delevigne. An unmissable luxury project!